According to nVidia, the GeForce GTX 400/500 family of GPUs are based on nVidia’s Fermi architecture—the most significant leap in GPU architecture since the original G80. G80 was our initial vision of what a unified graphics and compute processor should look like. GT200 extended the performance and functionality of G80. With Fermi, we have taken all we have learned from the two prior processors, analyzed the various applications that were written for them, and developed a completely new architecture optimized for next generation games and applications. 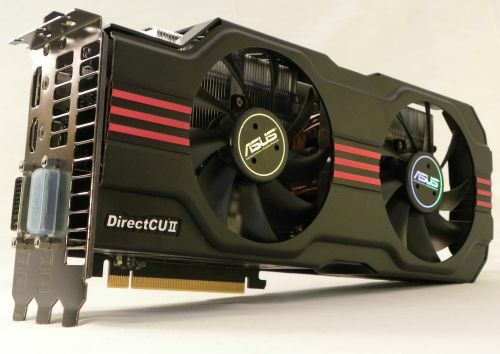 ASUS has added the GTX 570 to its line up of Direct CUII graphics cards. 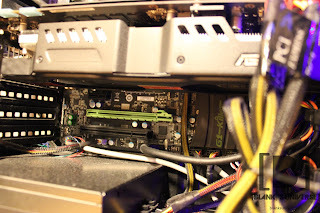 This features a tri-slot cooling solution that has copper heat pipes that directly contact the GPU processor surface. Other solutions normally have another piece of heat conductive material between the heat pipes and the GPU chipset. This dual fan configuration with direct heat pipes reduces the heat output by up to 20% than the reference GTX570. It also features super alloy power that results in a 15% performance increase and a 2.5x longer product lifespan. 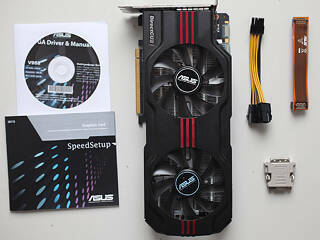 The ASUS GTX570 comes in the standard green ASUS nVidia box and includes a drivers CD and manual, along with a longer SLI bridge, a two 6-pin to one 8-pin PCI-E power connector, and most importantly - the graphics card. The cooler on the ASUS GTX570 is quite large as it takes up three slots on your motherboard and case. It feels very heavy and well built. The rear I/O of the card has dual DVI outs, one display port out, and one HDMI out. nVidia has also confirmed that it is only possible to run two monitors off a single card. It is possible to get digital audio out from the HDMI port on the card and also supports nVidia 3D surround. 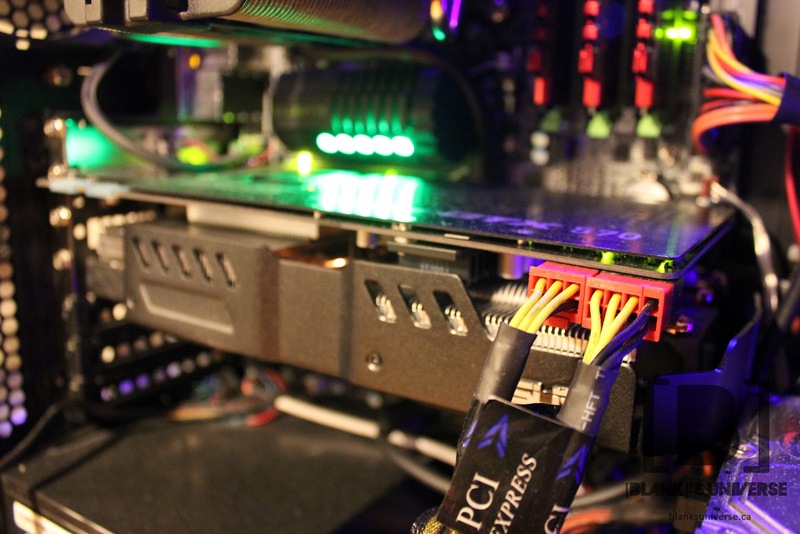 The card is powered by one 6-pin and one 8-pin pic-e power connector to allow room for extra over-clocking. The card also features a back plate that adds to the appearance of the card as well as providing rigidity to the PCB which I found to be very flimsy. 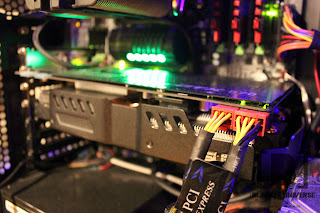 It has two sli connectors on the edge so it is compatible with up to 3-way SLI. 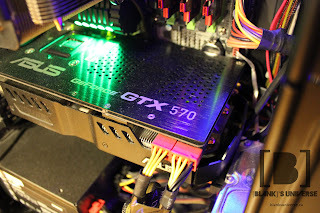 Any GTX570 from different manufacturers can be used in SLI with this card. The card is cooled by two 80mm fans blowing air onto a massive heatsink. it is covered by a very well built metal cover that does not cover the entire card. Extra air is exhausted through all sides of the card as well as the back, so decent cooling in your case is recommended. The dual 80mm fans run very quite as they do not have to rev up alot during heavy load and they revolve slowly on idle do to the massive heatsink. The GTX570 is power by nVidia's revised GF100 core and it is focused more towards more power per watt. This card is the successor to the previous GTX470 and feature more power while using less power than the GTX470. It also provides enough power to play any game on the market on high settings on a 1920 x 1080 display. Overclocking this card has also been made very easy by ASUS' GPU Tweak utility (You could also use MSI Afterburner for a better GUI). This card proves very stable power for overclocking as well as extra power due to the addition of the 8-pin connector instead of the extra 6-pin connector. The Direct CUII heatsink has enough cooling power to cool the sard under overclocking specs maintaining the card at a safe temperature. Battlefield 3 is know to be very demanding on graphics cards running the brand new frostbite 2 engine and requiring Microsoft's Direct X 11. I found the gameplay to be very smooth, and clean. I found the frame rates to be very similar between the daytime and night time maps in multiplayer but found frame rate drops when there were a large amount of players and explosions. I found this graphics card to be very reliable and powerful. ASUS' addition of a dual fan tri slot cooler dramatically reduced the temperature of the card under load and on idle. The GTX570 is well capable of playing any game on the market with high presets and is very quiet in its operation. If you have any questions or comments, post below and we'll be happy to answer!